Should you drink alcoholic beverages while pregnant? The answer plain and simple is no. Women that are pregnant should not drink alcohol period. Alcohol consumption can cause both physical and mental defects. Alcohol passes through the placenta to the baby. This can cause mental retardation, malformed organs, low birth weight, miscarriage, stillborns and a host of other maladies. No amount of alcohol is safe during pregnancy. Some women may feel that social drinking is permissible but even light drinking can cause damage. Although it may seem unlikely that an occasional alcoholic beverage such as drinking a wine cooler now and then could be harmful to the unborn fetus, it is still best to refrain from drinking any beverages containing alcohol throughout the pregnancy. There is no need to unduly risk the health of the unborn child. A person can be socially active without having to engage in the consumption of alcohol. Refraining from the use of alcohol during pregnancy is a small price to pay in order to bring a healthy child into the world. Alcohol can do major damage to the unborn fetus. Babies born with Fetal Alcohol Syndrome, a combination of physical and mental defects can require lifelong care. There is no treatment for the defects alcohol can cause in these infants. But Fetal Alcohol Syndrome is preventable. Don’t drink alcohol during pregnancy. 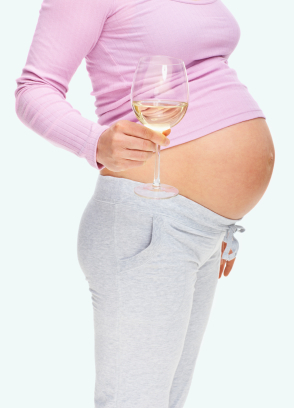 Pregnant women need to be aware that when they drink so does their unborn child. Mothers-to-be should seek treatment for drinking problems at once especially when they find out they are pregnant. The fetus can become addicted and suffer damage that will last throughout life. Alcohol can even kill or damage brain cells causing mental retardation and other birth defects. Children born to mothers that consume alcohol may have poor coordination and be slow in mental and physical development. Babies born to alcoholic mothers can suffer from withdrawal symptoms that can last for several weeks and even months. While it may be socially acceptable to drink alcoholic beverages it is never acceptable to drink while pregnant. If friends offer you a drink remind them that you are pregnant. When attending a social function, party or other gathering opt for a healthy drink rather than the alcoholic beverage. If alcoholism is a problem, seek help. You have to make a choice. Are you willing to put your child at risk? The effects of consuming alcohol during pregnancy can affect you and your child for the rest of your lives. Make the right choice. Choose health for your baby and yourself.